Craft room tour today. Yes people the first room in my house is finished and when I say finished I mean finished! And I am loving this space. Remember when I showed you the before of my big, lofty attic space and told you I had converted it into two smaller rooms. Well this is one of them. An attic craft room that forced me to get creative with storage solutions in such a small space. Let me give you a little tour…. That first picture is what you’d see when you first walk in. A big old office table turned craft table. The table is big enough that I can have both my sewing machines out at the same time, or big enough to spread out a lot of craft supplies and still have room to work. The table is standing at the one large wall I had, hanging up two organizers gives me plenty of room to store the little doodads you want to have around a crafting table. I found the gift wrapping organizer at a Craigslist kind of site here in the Netherlands. You can see I had to work with a sloped ceiling. I really liked the sloped ceiling storage solution I came up with in the old house, so I made an improved version of it in this house too. Basically it is a giant tangram puzzle (remember those), where you try to use every bit of space by stacking and moving all kinds of little cupboards, drawer units and boxes to create a wall of storage. This version is a combination of Ikea cabinets and thriftstore finds. I didn’t bother giving everything a fresh coat of paint, since it was all either white or wood tone anyway it fits together nicely. Can you imagine how much stuff one can hide away in all of those drawers and boxes? Well let me tell you it is a lot. And since basically everything is labeled (the few things that aren’t will soon get a label treatment too) it is easy to find my stuff. Craft rooms are busy rooms that hardly ever look as neat and tidy as this, or at least mine hardly ever does. But I’ve found that using this more quiet color palette and keeping it basically free of decorations that take up precious space it is a rather soothing space to work in. I love spending time in here. I have missed all of my creative things, it was fun unpacking it all and revisiting with old friends that were boxed up for almost two years. I am not so sure I loved seeing how many UFOs (UnFinished Objects) came out of those boxes too. But what do you know maybe I’ll get inspired to actually finish them now…… one can dream…. On the other side is a short wall next to the entry. I moved my bakers rack /trolley into this space. It holds a variety of boxes, little suitcases and an assortment of glass containers. In it are my ribbons, laces, buttons, sewing threads and all those other things one needs in a craft room neatly organized in their own designated container. The things that are actually nice to look at like lace, ribbons, buttons and selected sewing threads got a place out in the open in a collection of glass vases. 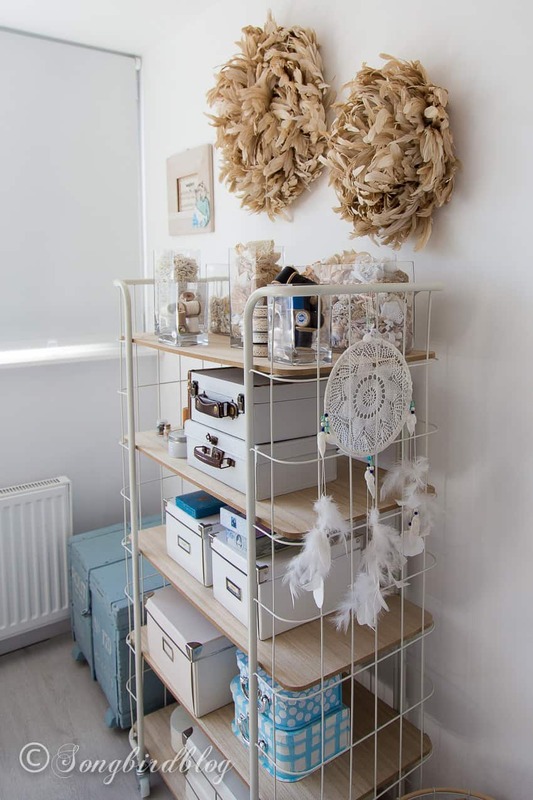 Storage and decoration in one, a golden combination in a craft room. My juju hats /feather wreaths feel quite at home here too. With three large windows facing almost south the lights floods into this room. In fact I had to close at least two of the window shades while taking these pictures or they would all have been washed out from all that light. This is definitely not a dark, dreary attic space, instead it is bright, cheery and very much how I envisioned it from that first day I laid eyes on this space. I hoped you enjoyed my craft room tour. It was my first room reveal for this house. There are many to follow. I am very close to finishing the guest room too, so that will be next. Stay tuned. For now, I have to go. There is a craft room waiting for me, that is begging me to come play in it…. It is beautiful and so organized. Enjoy it. Thank you! I am over the moon happy with it. Wow, so gorgeous! I actually thought at first this was your past home due to that sloped ceiling! They seem to be your trademark because you certainly do them right! I love your tip about low on decor, allowing your storage to take the stage. Which actually is beautiful enough to look like decor! Thanks for stopping by. And of course thanks for the compliments. I love being back too. So beautiful; so soothing & relaxing–Just how crafting should be! I always seem to be in a frenzy when I’m working on a project, when it would actually be so wonderful to be in a calm state of mind. Your new room will do that for you. It’s lovely and a great job you did! Enjoy!!!!! Thank you! Yes my new room has a good effect on me. Prachtige kamer geworden Marianne. Veel craftplezier ermee. Dat zou leuk zijn. Daar gaan we aan werken! Didn’t you have a card catalog in the craft space of the old house? Have you used it in another room? Of course, those are useful in just about any room! I did use to have one. It stayed behind in the old house, so for now I have to live without one. But I am hunting…. It’s beautiful – so inspiring! 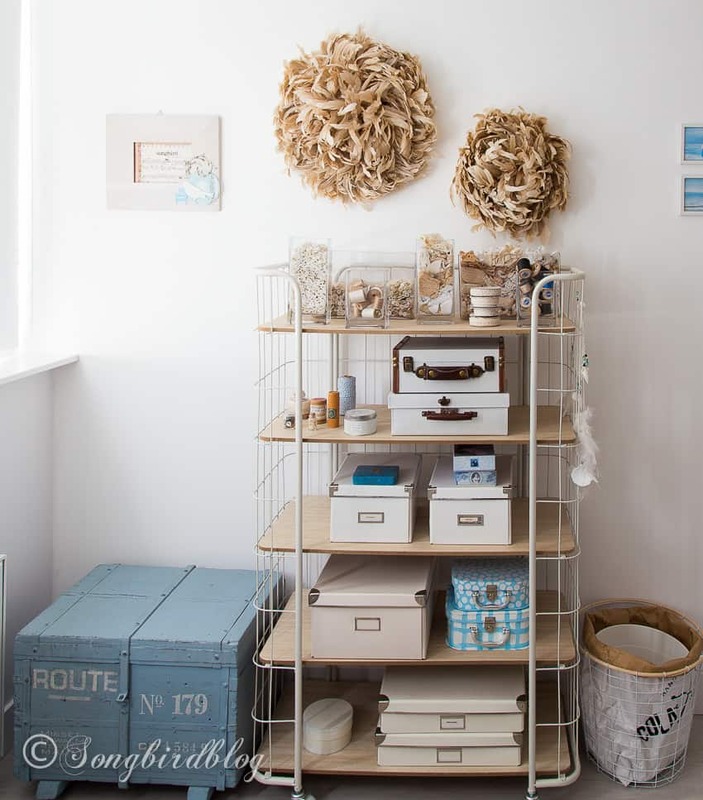 When I return from my trip to Portugal, I’m going to do a makeover of my craft room! Portugal! Lovely country. I am currently in France. Good luck with your craft room makeover. get a personal tour of your favorite places to find home goodies! favorite thrift stores and antique shops! Aloha! Oh, I am envious. I have just bought a new table for my sewing machine and overlocker and I’m trying to decide on a final set up for my room. I keep moving the furniture around trying to find the right arrangement. I love the wire organisers you have used on the wall. I’ll keep my eye out for something like them here in Australia. You’ve inspired me to get into my room again and rethink my plan. Oh! That is wonderful to hear. I love that I inspired you. Good luck with setting up your craft room. You are the master (mistress?) of pretty space organization! Marieanne, this is awesome & so exciting! You did a great job & truly utilized the space you had. I def need one. When I can i expect you? Lol…I have been pulling for you for these past few years. I’m so happy you are back in the land of blogging (where you belong)! You have been missed. This is a fun-looking room! I like your line of drawers with the map fronts. It adds a pop of color and interest. Did you decoupage some ikea drawers? I also love your “tangram wall.” That’s exactly what i need to do in a space I have. Thanks for sharing. Enjoy! Thank you for sharing!! I’ve been saving the post to read and take time to look at each thing. I like your evolving look. This attic room works so well. It’s nice to have this space to give to your creativity. Out of site of the daily routines of life! Each area is functioning well yet does not look cluttered. I like the cubbies with maps. You truly are a world traveler with decor from around the world represented in your diy projects as well! Enjoy this great room.